The Accuthotix™ Laboratory uses the most advanced 3D scanning and fabrication system in our market. 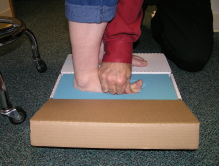 It is extremely important that we receive a proper foam cast or plaster slipper impression. The overall goal of casting is to provide the lab an impression of the foot in its subtalar neutral, semi-weight bearing or non-weight bearing position. Please follow the instructions below. 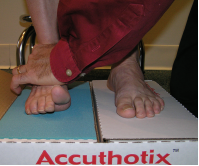 ** Prior to the casting procedure, you may use any mobilization technique to improve the accuracy of the cast and assess the degree of rigidity of the foot. 1. 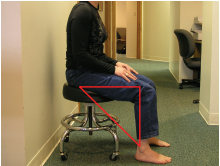 Seat your patient so there is a 90-degree angle at the hip, knee and ankle. 2. 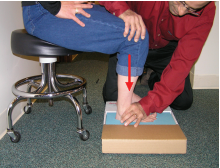 Locate the sub-talar neutral position by grasping the ankle mortice, palpating the talus bone to ensure that it is even on both the lateral and medial side. 3. Lock the talus in its neutral position. 4. 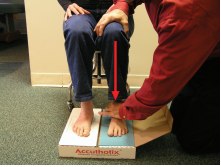 Use your other hand to push firmly down on the patient’s knee while applying simultaneously mid and forefoot force on the ankle. 5. Next, press down on each individual metatarsal head and toes. The impression should be about 2 inches deep with even depth at the forefoot and the rearfoot. 6. Remove the patient’s foot from the foam impression andmake sure that the depth of the rearfoot and forefoot are equal.The contour of the medial longitudinal arch should appearuniform. 7. Repeat procedure with patient’s other foot. Complete our Accuthotix™ quick step order form; include your check or credit card information. Seal the box and use our pre-paid postage.